Makhanas or Gorgon Nut or Fox Nut (Euryale ferox) are the seeds of a plant from lilly family, which has purple flowers not dissimilar to lotus flower. This is why they are sometimes confused with and described as puffed lotus seed, which they are not. The plants are cultivated in ponds all over northern India, especially in Bihar. The Makhanas that we use as food are the puffed kernels of the seed pod. They can be used for making sweets, savoury 'Namkeen' mixes and desserts as well as for additions to Curries. Roasted makhanas can be sprinkled with a little salt and pepper and eaten as pop-corns. 8 tbsp. sugar. Use artificial sweetener for diabetics. *Soak green pistachios (un-roasted and unsalted) and almonds in a bowl of hot water for a couple of hours. Skin will now peel off easily. Reduce milk to 2/3rd the volume by boiling briskly in a heavy bottomed pan. Keep stirring to stop it from 'catching' at the bottom of the pan. Burnt milk tastes terrible and has to be thrown away! Keep scraping milk that sticks to the side, back into the milk using a wooden spatula. 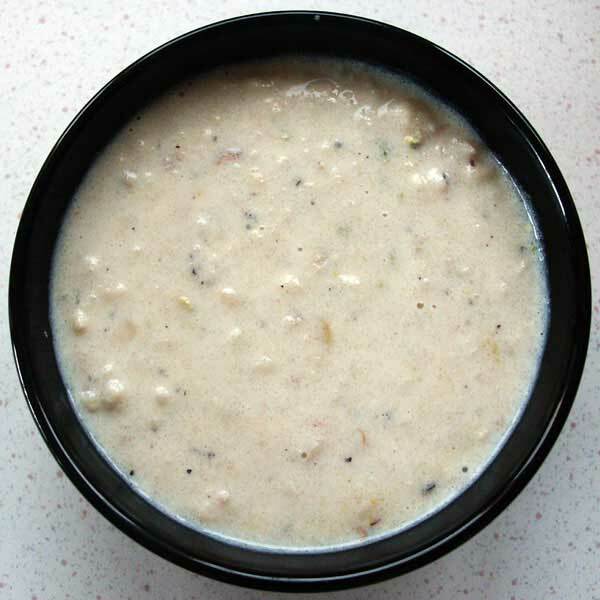 This gives the kheer its 'rabri like' texture. While the milk is boiling, clean makhana by removing/cutting off any black shells or hard skin bits off. Light brown spots are okay. Good makhana should not have many such shells. Heat 1 tsp. of ghee in a wok or karahi and fry the makhana on medium heat. You can dry fry them, without the ghee, if you wish. They become crisp when cool. Chop them in a food processor, some will be fine while others are coarse. Add all the makhana, ground and coarse, semolina and saffron to the boiling milk and cook for 15-20 minutes, stirring frequently. Turn the heat off, add saffron strands, cardamom powder, sugar, 3/4th of the almonds and pistachios. Transfer to a bowl and Chill. Sprinkle remaining almonds and pistachios as a garnish. This milk pudding can be served warm too. The kheer should be of custard like consistency. Remember that it will thicken a little as it cools. However, if it is too runny and you want to make it thicker, add 2-3 tbsp. ground rice powder dissolved in a little cold water or milk. Boil for 4-5 minutes. 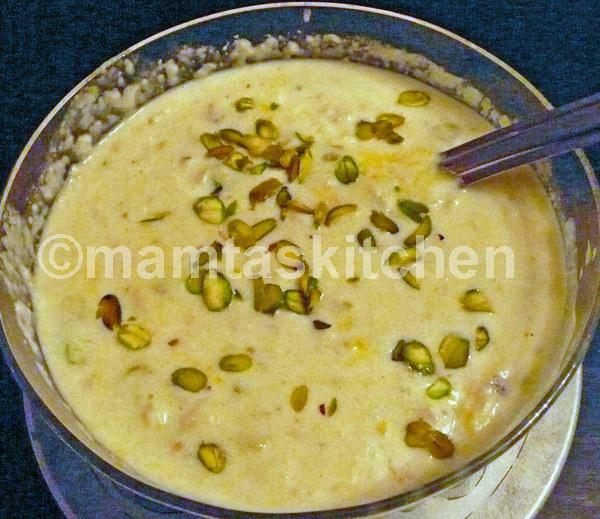 You can also use ground rice to thicken a kheer, if you dont want to condense the milk or want to use skimmed milk. Tip from Yashodhara; Add 2-3 tablespoons full of dessicated coconut along with makhanas. It adds to the flavour.